2. Sift the flour into a bowl, there is add cocoa, baking powder, sugar, eggs, milk and butter. Mix everything together using a mixer and divide into 2 parts. 3. One portion of the dough pour in a baking pan and leave it for 5-7 minutes in the preheated oven. I take the first one and sent back the same second too for 5-7 minutes. 4. While cakes cool, make the cream. Bred in water coffee. Whisk cream until then, until they become very thick, and add them in diluted coffee and whisk some more. 5. 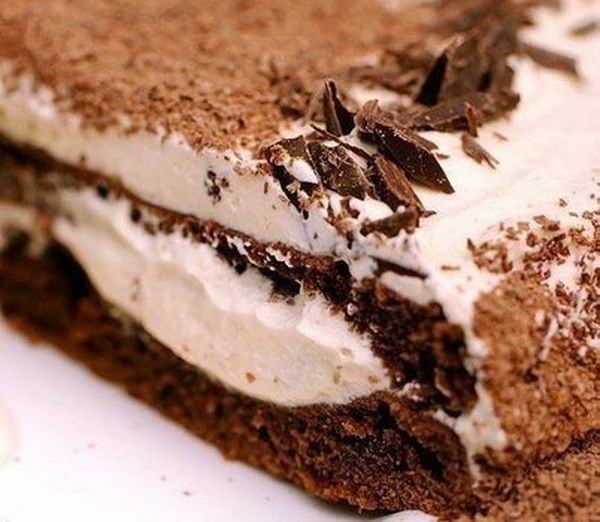 Collect the cake: put the first cake layer, then cream, cake, grease remaining cream and sprinkle with grated chocolate. The next day the cream soak into the cakes almost completely.